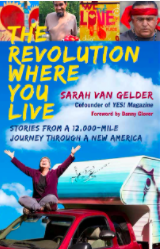 Invite Sarah van Gelder to speak at your event, or to appear as a guest on your radio or television program. Or bring “The Revolution Where You Live” to your book club or local organizations. The Revolution Where You Live — How local communities are transforming the world, and how you can be part of it. Focus on climate justice, economic justice, and racial justice. Stories and Slides from My Road Trip — The people Sarah met, from Native American reservations to the streets of Detroit, from the coal fields of Kentucky to Montana ranches—the people who are making change where they are. What it means to tell powerful stories in a time of crisis — These are not ordinary times, and the stories we need in these times are also not ordinary. Examples of powerful reframing and the emerging new stories of our time.